Author Scott Baker in his book Pride, Idolatry and Hypocrisy: The Gospel According to the Christian Right is a compelling and challenging book that addresses issues of pride, idolatry and hypocrisy in the modern day church of Christianity. Exposing the apostasy of the church, the author also delves into the fundamentalist mindset of corporate church and organized religion. The messages, values and theology taught from the pulpit today are far from the true Gospel of Jesus Christ and as the author states, "Christianity in America has lost its way." Mirroring the religious hypocrites of Jesus' day, today's preachers are more concerned with money, greed and power, while neglecting the poor and preaching salvation to an unsaved world. Satan is happy, very happy with organized religion and the ignorance of God's Word, which has left those inside the church powerless and ineffective to bring true healing and power to a world that cries out for justice. The author encourages all to take a look first within and points to follow the teachings of Jesus Christ. He ends his book with an explanation of how one is to be saved and how to let the Lord be the Lord of your life. This book is a call to those that adhere to the true Gospel of Jesus Christ and a call to all God's children to come back to their Heavenly Father in Heaven just as the prodigal son did. Author Scott Baker has much to say about today's Christianity and organized religion. His message is simple, as he states, "God is calling His church to repent, to stop living for this world and to return to Him. He wants our precious hearts, not our lukewarm piety and religion." This book is a call for those that have a passion for the Lord Jesus Christ to stand in their God given inheritance and a call for a national repentance upon America, to include the religious Christian community. 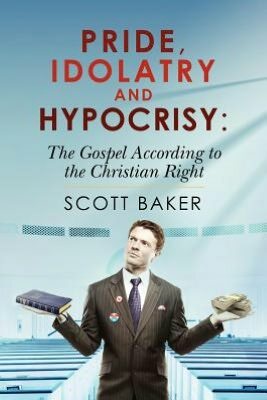 Pride, Idolatry and Hypocrisy: The Gospel According to the Christian Right by Scott Baker is available at Amazon and other fine online bookstores. Going Global through Christian Book Marketing book reviews.